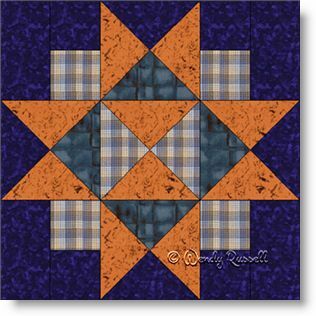 The Four Corners quilt block resembles the Ohio Star, but has additional interest in both the centre of the block and the four corners. This block is a wonderful choice to enhance your piecing skills as there are many quarter square triangle patches used in the block. The cutting instructions I have given will leave you with a few extra quarter square triangles to use for other blocks. It is a better choice to cut these pieces in this manner, rather than as half square triangles for those patches, in order to make the best use of the grain of the fabric and prevent distortion of the pieces. The sample quilts illustrated give you ideas of how you may introduce sashing between the blocks to add extra interest or to give the illusion of "floating" blocks, by using the same fabric as the background for the sashing.